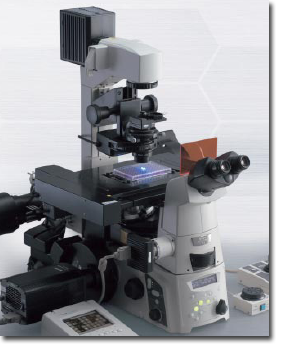 Materials ranging from thin films, plastics, fibers nanoparticles, emulsions, to material science, metallography, FPDs and microcircuits can be easily visualized and documented with this specialized microscope. 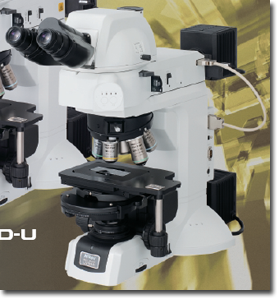 The AZ100 covers a wide range if magnifications, from 5x to 400x, all in a single microscope. It can continuously switch magnifications extending from macro to micro observation of the same specimen. 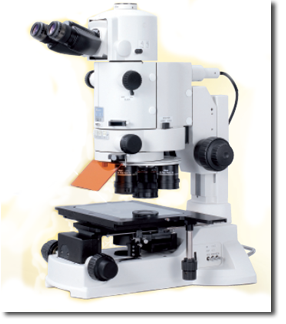 It offers the combined advantages of a stereoscopic microscope with a wide field of view and long working distance, and a biological microscope boasting high resolution images. Ti-E inverted Microscope with Perfect Focus. The Ti inverted microscope supports diverse image acquisition and analysis methods such as multidimensional time-lapse imagining to acquire temporal, spatial and spectral information of fast, dynamic live cell processes. It is ideal for applications such as confocal, FRET, High Content Analysis (HCS), and photo bleaching/photo activation to study interaction of fluorescence protein molecules in living cells and tissues. Nikon's exclusive Perfect Focus System (PFS) is now incorporated into the nosepiece unit and allows the simultaneous use of two separate levels for additional illuminators or detectors. The newly developed "full intensity" phase contrast unit enables acquisition of incredible phase contrast images without the use of light-attenuating phase contrast objectives. The CISI is a true spectral imaging confocal laser microscope system with the capability to acquire 32 channels of fluorescence spectra over a 320 nm wide wavelength range in single pass. It can un-mix overlapping spectra of different fluorescent labels, thus improving dynamic observations of live cells and facilitate the acquisition of detailed data. The scaner can be fitted to all microscopes for spectral imaging.